Looks like I am on a berries hype isn't it? Actually, not so. It is just that these berries (raspberries, strawberries and a couple others) are so pretty when they sit in the fridge but they don't last that long for me to wonder how I should play around with them. Hence, in my attempt to finish up the last few raspberries in the box, here comes my version of Mixed Berry Soufflé. #P/S: Yes, I still have another box of strawberries and those will be for another time, another recipe. 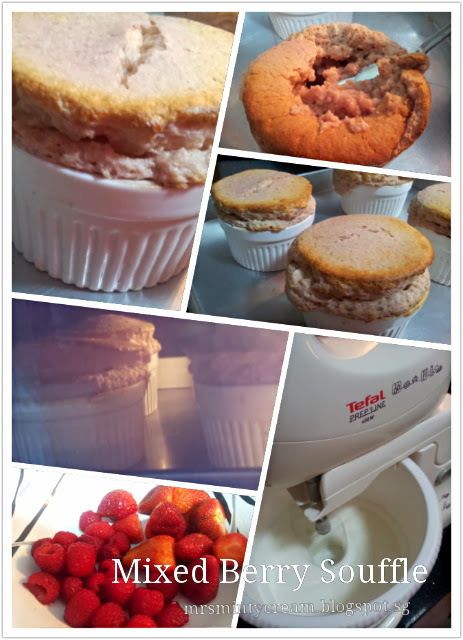 As you can see from the photos, the rise of the soufflé isn't that perfect, but still, compared to my last attempt of Nutella Soufflé, this batch of Mixed Berry Soufflés has given a better height and they do look pretty nice right? However, I have to be very honest to say that the taste of the soufflés isn't really what I was looking forward to. It was a little too mushy and eggy and I presumed this is due to the egg yolk in the batter. After making this batch of Mixed Berry Soufflés, I have managed to find another recipe which does not require the use of egg yolks and I am planning to give that a shot soon. 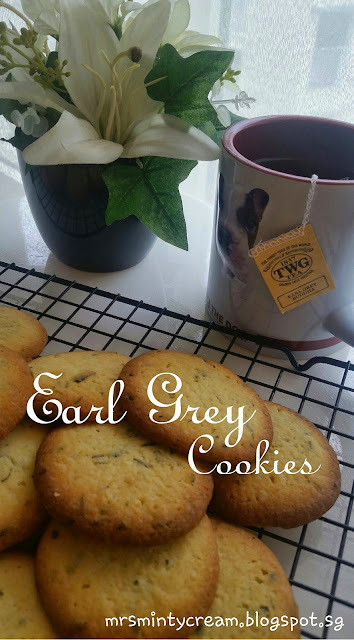 But still, I do enjoy sharing my recipes, whether they are excellent, good or just plainly average. I believe that it is the joy in sharing which motivates one to continue trying and experimenting. This is also the exact reason why I enjoy teaching as well. 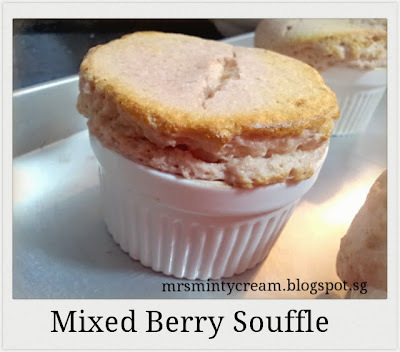 So, here we go with the recipe for Mixed Berry Soufflé. 2. Spray the base and insides of 8 small ramekins with non-stick spray and dust them with cocoa power. Chilled the ramekins in the refrigerator until you are ready to use them. 3. Blend the raspberries and strawberries together using a blender / food processor until a smooth puree is formed. 4. In a saucepan, place the berries with the sugar and vanilla extract and heat them up slowly. Using low heat, stir the mixture until the sugar has dissolved. When the mixture is well-mixed, has thicken and starts to boil, remove from the heat. You should get a smooth puree. 5. Sieve this puree through a sieve to remove the seeds from the berries. You will need to push the puree through the sieve using a spatula to get a nice and rich jam mixture. Cool the jam in the fridge. 6. Heat the milk and whipping cream in a saucepan until it is almost boiling and set aside. 7. Sieve the all purpose flour and corn flour together and set aside. 8. In a separate bowl, beat the egg yolks with sugar (40g) to get a creamy mixture. Mix in the flour mixture and combine them well. The flour will helps to thicken the mixture and you should a creamy and smooth texture. 9. Add 1/4 cup of the heated creamy milk to the mixture and whisk well until the mixture is smooth. Gradually mix in the rest of the creamy milk and continue whisking. Pour the mixture back into the saucepan and whisk over low heat for 5 minutes to get a thick and smooth creamy mixture. Cool the mixture in the fridge. 10. After both the jam and cream mixture has cooled down, add the jam to the cream mixture and mix well to get a nice and smooth texture. 11. In a clean bowl, whisk the egg whites using a stand mixer, until soft peak formed. Gradually add in the sugar (50g) while whisking to get a thick, glossy and firm meringue. 12. Once the meringue is done, fold it in with the jam & cream mixture in Step (9) a third at a time. Make sure folding is done gently so as the air in the meringue is not knocked out of the mixture. 13. Fill the ramekins with the soufflé mixture. Tap the ramekins gently on the tabletop to ensure that the mixture is evenly spread through the ramekins and air pockets within the mixture is removed. This will helps the soufflés to rise up evenly. 14. To help the soufflés to rise better, smooth the top of the ramekins using the back of a butter knife and run a circle around the edge of the ramekins using your thumb. 15. Bake the soufflés in the oven for 10-12minutes or until well risen with a light golden brown top. Serve immediately. If you would like to, you may dust with icing sugar and garnish with berries before serving. I did not do that because I felt that a good amount of sugar has already been used in the recipe as well as I do not have any extra raspberries for garnishing. As mentioned earlier, I also did not quite like the eggy taste in the soufflés itself which I believed was due to the egg yolks in the mixture. So I will be trying another recipe which does not require egg yolks in it. Hopefully that will cater to my tastebud better. Other than that, I'm pretty happy with the appearance of the soufflés. They are pretty well risen (compared to my previous Nutella soufflés) and the texture of the light golden brown top was really chewy and nice. Got to keep improving!